Description: The 4th Annual Georgian Triangle Music Fest presented by Yamaha Canada and Wasaga Beach Brewing Company will attract approximately 35 acts from the region across 7 venues in Wasaga Beach from June 30th to July 2nd. This is a free event highlighting multi-genre music with the kick-off set on Thursday, June 30th featuring live entertainment from 7:00 p.m. to 11:00 p.m. at the new Main Street Market located at Beach Area one. Joining Dianna on this week's BEACH CORNER is Event Coordinator and Founder of Georgian Triangle Music Fest, Shawn Crozier. Shawn will share the artists performing as well as the venues hosting the event. Included in this show are songs from two of the acts performing in the festival, Greg Mashinter and The Coyote Kids. Be sure to look for the next Special Edition beach BOOSTER publication for all the Music Fest schedules along with Canada Day weekend festivities. 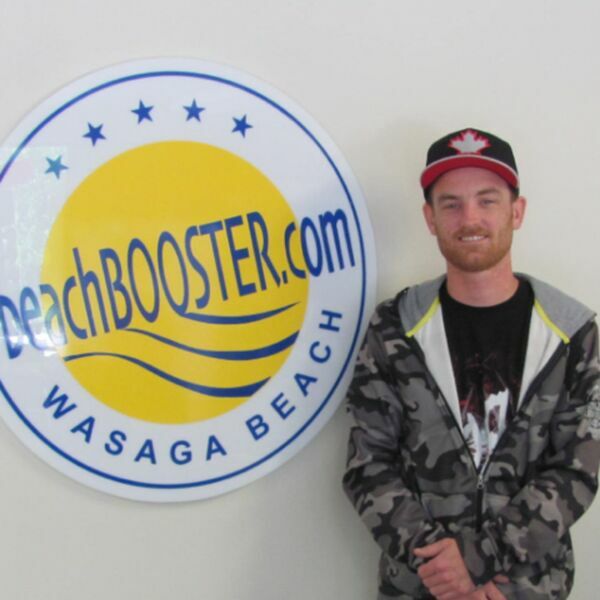 Photo: Shawn Crozier visits the Beach BOOSTER Radio studio. BEACH CORNER available ON DEMAND anytime on any device from our Beach BOOSTER Radio Podcast page. The 4th Annual Georgian Triangle Music Fest presented by Yamaha Canada and Wasaga Beach Brewing Company will attract approximately 35 acts from the region across 7 venues in Wasaga Beach from June 30th to July 2nd. This is a free event highlighting multi-genre music with the kick-off set on Thursday, June 30th featuring live entertainment from 7:00 p.m. to 11:00 p.m. at the new Main Street Market located at Beach Area one. Joining Dianna on this week's BEACH CORNER is Event Coordinator and Founder of Georgian Triangle Music Fest, Shawn Crozier. Shawn will share the artists performing as well as the venues hosting the event. Included in this show are songs from two of the acts performing in the festival, Greg Mashinter and The Coyote Kids. Be sure to look for the next Special Edition beach BOOSTER publication for all the Music Fest schedules along with Canada Day weekend festivities. Photo: Shawn Crozier visits the Beach BOOSTER Radio studio. BEACH CORNER available ON DEMAND anytime on any device from our Beach BOOSTER Radio Podcast page.